Sometimes I live in fantasy land and have a dream that I will leave work, hubby will take a sabbatical and we'll remove the children from school for a year to travel the world. I strongly believe there is no better education for your children than travel - the enriching experiences, exposure to other cultures, sights, smells and history of actually visiting somewhere just doesn't come close to reading about somewhere from a text book. However in reality, unless we win the lottery, I very much doubt this dream will ever come true. With that in mind I have created a list of the top three destinations I would like to take my children before they grow up. Let me know what you think. 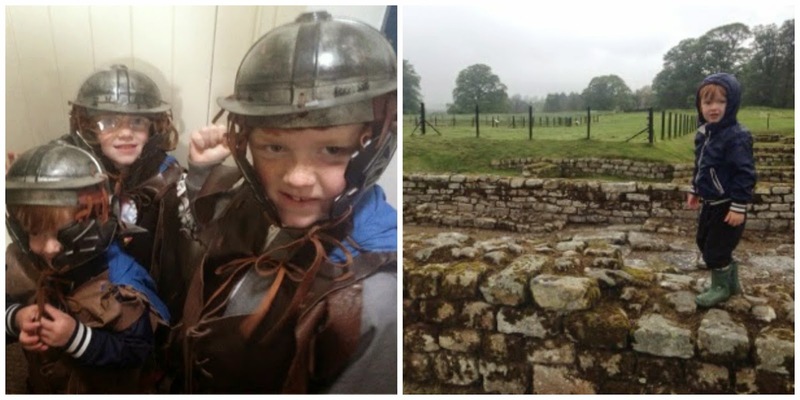 Our family has a keen interest in Roman history and our eldest son is actually in the middle of an 8 week school homework project where he is creating a Roman comic telling the story of how Rome was founded and has created his own Roman blog. 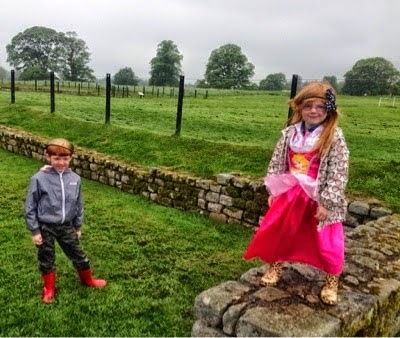 As we live in Northumberland we are very lucky that we are close to Hadrian's wall and have spent many an afternoon here exploring forts, climbing the wall and discovering history. We are keen to learn more and I can't help but think how fantastic it would be to take my children to Rome and let them see the Coliseum, Pantheon and all of the places they have read about on the internet for themselves. Before I travelled to Marrakech with my husband I would definitely not have considered it as somewhere to take our children but I have definitely made a complete U-turn. 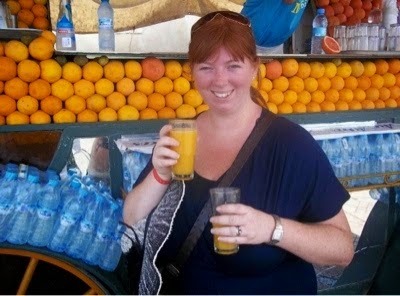 I would love for them to experience the magic of Jemaa el Fna for themselves. Where else can you drink freshly squeezed orange juice, sample a huge array of street food, watch street performers and magicians and become entranced with snake charmers and storytellers? It certainly beats a night at a mini disco that would form part of a more traditional family holiday. As a family we love glamping. Nothing beats the freedom that staying outdoors gives you and it is the perfect way to get away from it all. I have a little dream that one day we will hire a VW camper van and go off on an adventure around Cornwall. Just driving wherever the day takes us, stopping off at beaches along the way before finding a farm or campsite to park up for the night. I would just love the freedom the be able to do this and think it must be the ultimate way to travel. Cornwall is a much-loved destination of mine as we used to spend our Summer there as a child. I would really like to return with my own children and discover hidden coves, eat cream teas and navigate the winding country lanes for myself. I am really determined to tick this from our bucket list soon! 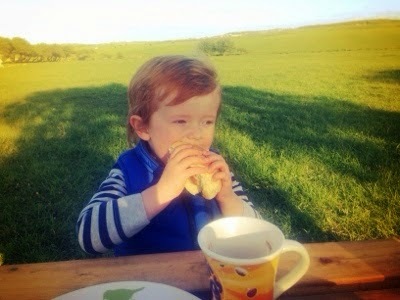 I love this photo of Jack enjoying al-fresco breakfast on a glamping trip last year and imagine this would be what every morning would be like if we were to stay in a camper van. This is our entry to the Transun Travel Bucket List competition which closes at 11:59pm on 30th April. Details can be found here. Let me know if you have entered or where your top three travel bucket list destinations would be. I've not been to Rome, I heard it's very cool if a little frenetic but I'd still like to experience it for myself one day. My top 3 (waah, I have to choose only 3? ;) ) bucket list is Niagara Falls, Australia and hmm Grand Canyon I think would have to be my 3rd. Oh I've never thought about Pompeii - will have to look into it! Well you inspired me to write my own post about for the competition and I've been busy on it all morning, haha. It really *is* hard to just choose three though! We have been to Rome, quite a few years ago, we were in Florence on holiday and jumped on the train. Trains in Italy are fab! It is absolutely beautiful, we only scratched the surface as we only had a few hours there but we got to the Coliseum and Vatican City. We will go back one day, Italy is breathtaking, I adore the place and is where we would go to if we ever could move abroad. Also been to Venice, words can barely describe it. All I will say is if you get the chance to go, GO!! Italia - Bellissimo! Ah Mandy - I want to gooooooooo!!!! !